Square is mostly known for its distinctive credit card reading dongle, which has become a hit with small business owners. But the company has also been pushing a cloud-based consumer mobile wallet app called Card Case that allows people to pay participating merchants without pulling out their credit card. While Square is now processing $4 billion in transactions, largely through the card reader, the future will likely turn on its payment app for consumers. The company is relaunching that app, formerly known as Card Case, as Pay with Square on Monday. The biggest news is that Pay with Square is expanding from the iPhone (s aapl) to support Android (s goog) consumers and will include new features aimed at helping consumers discover and with merchants. “We do believe Pay with Square is the most seamless way to pay and drives the most value for customers and merchants,” Square’s Director of Products Megan Quinn. That’s not to say that the credit card reader will take a back seat anytime soon. Quinn is not sure when or if Pay with Square payments will eclipse payments through Square’s card reader. But she’s right in that the Pay with Square experience is more engaging and fun for consumers and more powerful for merchants than the reader. 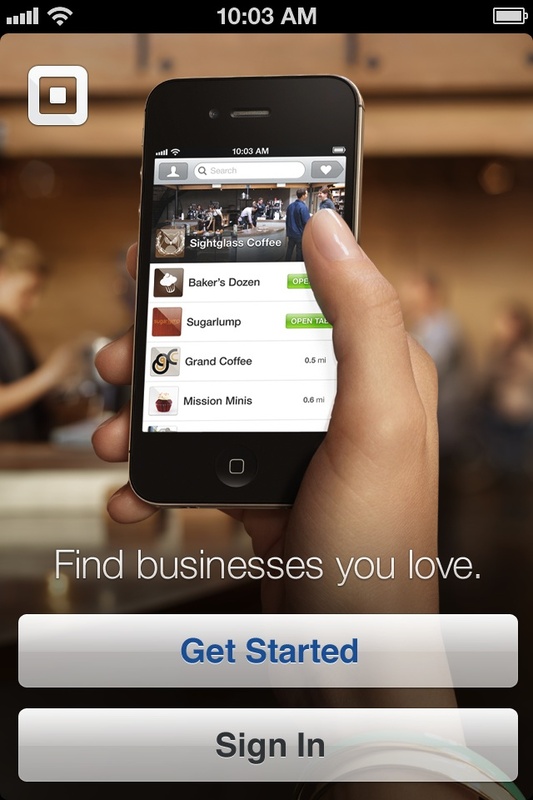 That’s what Square is ultimately shooting for. The company isn’t just looking to provide a cheaper or simpler way for merchants to accept payments. The Pay with Square app currently allows users to register credit and debit cards inside the app. 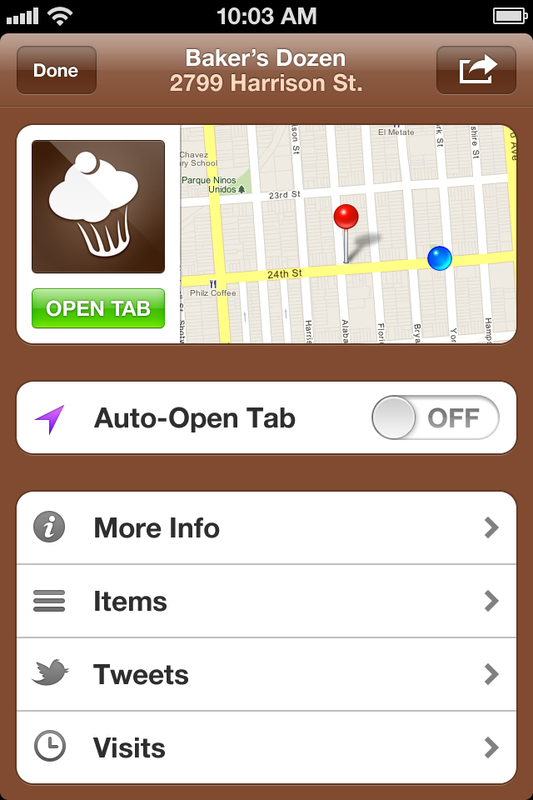 When a user enters a business they can open a tab on their app, which notifies the merchant of their presence and shows the merchant a picture of the user. The customer can just order at the counter and the merchant can process the transaction by confirming their face against the notification on the merchant’s end. Square added an opt-in hands-free element in November that allows users to notify the business of their presence through location-based geofencing. The updated Pay with Square app brings the service to Android users for the first time. It features a redesign that emphasizes discovering merchants and includes an updated carousel of popular stores in the area that accept payments through Pay with Square. 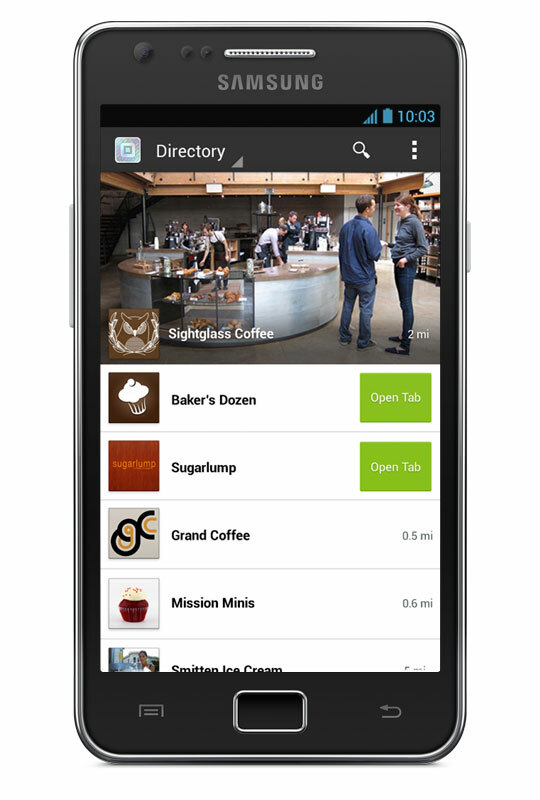 There’s also a search bar and a new map view of nearby merchants instead of just a list. And users are now able to share information about merchants via e-mail, Twitter and SMS though not through Facebook. These are the kinds of things that make payments more than just a transaction. They bring consumers in closer contact with merchants and help foster a relationship. That’s something that’s harder to do with the card swipe experience. Receiving a payment via a dongle is nice for a merchant but if they can be inside a consumer’s pocket through an app, they can push out offers, update them with new information and create more of an intimate relationship when a user is in the store. Only about 75,000 merchants are using Pay with Square, but Square is working on increasing that number by encouraging its existing Square merchants to adopt Pay with Square. The proposition is getting more attractive for merchants. Earlier this month, Square launched a Square Register iPad app that allows them to take credit card payments, handle former Card Case transactions, manage inventory and also run other aspects of their store. That includes updating their Pay with Square directory listing in real time to reflect menu changes and other business information. The move comes less than two weeks after PayPal (s ebay) announced plans for its small business product PayPal Here that will pit it directly against Square. While a lot of people focused on the PayPal Here dongle, I think PayPal is just as interested on getting that system to work with updated PayPal mobile apps. That connection is actually quite powerful because there are more than 100 million PayPal users and PayPal’s mobile apps have been downloaded about 17 million times. While the current battle is about giving merchants tools to accept traditional payments via cards, cash and checks, the real challenge and opportunity will be in enabling next generation mobile payments that work through apps. PayPal is going to try to rely on its scale and the growing pieces of its arsenal like WHERE, BillMeLater and its X.commerce platform to help merchants push out offers, provide new payment flexibility and get more back-end support for building up a business. Quinn told me that Square is also interested in enabling better offers and loyalty programs through Pay with Square. These are areas that it will definitely need to improve upon if it wants to build a leading mobile payment offering. But where Square will look to shine is in making payments more about the relationship than the transaction. That could be an edge over PayPal, which is a widely-accepted payment system online but doesn’t always engender great love from merchants or consumers. “We’re crafting products that create experiences for merchants and customers. Our competitive advantage is building an amazing experience; it’s facilitating the interaction not just the transaction,” Quinn said. It looks like Square has a long way to go with its “Pay with Square” app. Take a look at the reviews on the iOS App Store and you’ll see an abundance of negative reviews. In my city, the Square app lists merchants who don’t actually accept Square as payment. Why do they show up? I’ve sold exactly one thing using the Square card reader and even I show up as a merchant. Meanwhile, of the 12 merchants listed within 5 miles of where I work, I’ve only been able to use Square to pay at one of them — a small neighborhood coffee shop. The others I’d be interested in using Square to pay are literally moving targets — food trucks that drive around the city and are rarely in the same place twice. It looks to me like Square will need to partner with some big brands to get traction in the consumer side of this payment businesses. Great article Ryan! There are a lot of exciting things happening in the mobile payments space. Whatâ€™s incredibly important to remember is that brick and mortar businesses and consumers donâ€™t have a mobile payments problem, but rather a mobile shopping problem (quoted by Jack Stephenson, Managing Director at JPMorgan Chase and former head of payments at Paypal). Smartphones can help solve this shopping problem for both merchants and consumers, but the value points need to be aligned between the two. Jack makes a point that 95% of the time credit cards and cash work just fine, so for the other 5% of the time, the merchant will be asked to invest in a new POS system? That doesnâ€™t make any economic sense. Margins are tighter than ever and the competitive landscape is fierce. Merchants are looking for ways to, at minimum, pay the bills and more optimistically increase revenueâ€¦plain and simple. All investments need to be tied to that. In the 90s Amazon and eBay showed how state of the art systems can provide a more efficient desktop shopping experience, exposing inefficiencies with local brick and mortar and providing convenience to consumers to shop at home. Today, people are on their smartphones, and businesses want to be where their customers are. There is a leveling of the playing field happening by making the technology that was once only affordable by the Amazons and eBayâ€™s, now available for local brick and mortar businesses. We envision this being the initial steps in the revival of the local brick and mortar business â€“ the core of Americaâ€™s economy. All great points, Leo! Especially the quote from Jack Stephenson re mobile shopping problem.